The first sanctuary to be built was the Crypt, which is below the Basilica of the Immaculate conception. Construction started in September 13,1863 and was consecrated in may 1866, by the Bishop of Tarbes. Bernadette was present for the completion before departing for Nevers. The second sanctuary to be built was the Basilica of the Immaculate conception also known as the Upper Basilica. It rises above the one of the Rosary and the Crypt. the construction began in 1866 and was completed and open for worship in 1871. The third sanctuary to be built was the Rosary Basilica, Our Lady of the Rosary was successfully concluded thirty years after the Apparitions 1883 to 1889 and had great restoration work and improvements were carried out in 2006. The interior of the Rosary Basilica is impressive with a mosaic of the Immaculate conception and mosaics depicting the fifteen Mysteries of the Rosary. The fourth and fifth sanctuaries to be built were the Basilica of Saint Pius X and the church of Saint Bernadette. The Basilica of Saint Pius X is underground and colossal, the shape resembles an overturned boat. The church of Saint Bernadette is the newest construction and holds 5,000 people and took 7 months to build in 1988 it a very modern and spacious building. The heart of the sanctuary is the Grotto of the Massabielle. Pilgrims from all over the world come to Lourdes to pray at the spot where Mary appeared to Bernadette Soubirious. The name Massabielle Means "old Rock"
At the time of the apparitions, the grotto was on the outskirts of the town, on common waste ground, used by the villagers and the Hospital as a dumping ground and it had a reputation for being an unpleasant place with a an unpleasant odour. Virgin Mary instructed Bernadette to "Go and drink from the spring", "Go and tell the priests to build a chapel", and to "Have the people come here in procession". These requests from the Virgin Mary played one of the most important roles in having the domain constructed. Soon Pilgrims flocked from around the world as Public interest in the apparitions and the miraculous cures grew. Lourdes have estimated that 200 million people have visited the shrine since the first apparitions, to date ecclesiastic authorities have officially recognized 67 miracles, with thousands of miracles not officially recorded. As well as the Grotto their are specially made baths for pilgrims to immerse themselves in. There are 17 separate baths, 6 for men and 11 for women. The water runs straight from the spring into the baths and is not heated, each immersion lasts for a minute or two, allowing a short time for prayers to be recited. The baths have had great restoration work and improvements carried out over 1955, 1972 and 1980. Each year about 360,000 people use the baths. The Domain is open all year round, during the winter months, unfortunately, majority of the shops and hotels are closed for the winter season and the number of visitors are much fewer, with no procession. The winter season starts from the 1st November until Easter. 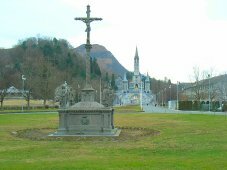 Their is one exception, during the winter months, on the 11th February, the Feast of Our Lady of Lourdes, a full program of activities normally takes place.